Full MIDI implementation: all parameters receive and transmit MIDI controllers. The keyboard can be used as a control keyboard polyphonic. Sysex transfers of all parameters. Configuration is very simple and very didactic, it is easy to access a machine without submenus enabled. A knob, button, knob = one function. So that is above reproach. For the manual must know English is essential (will not do the basics) to understand the operation of certain parameters including the Voyager setup menus. It can also be used for extensions of the synth (VX-351 and 352). Editing is very simple and the navigation is very easy changes. 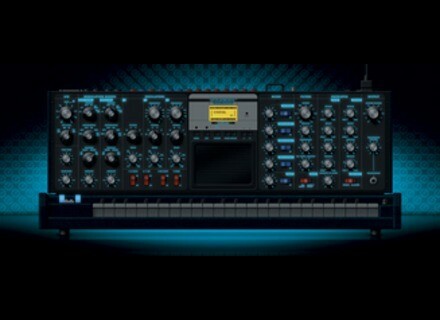 In terms of construction and finishes the Minimoog Voyager Electric Blue is totally successful. Modeled on the middle part of the Minimoog Model D (more compact anyway) so we have no trouble finding its bearings. The dark wood and beautiful, the knobs are best (in view of what happens in competition is significant), buttons (blue and red) snap into place like clockwork and the screen is fantastic but not very good job (in any case on this type of synth interactivity will be sought as natural as possible). Only the light blue of the screen is a little problem when it is pushed to 100% (low whistle in the distance). Moog is a problem that would manage the pre-market. But then he must remember that the Voyager is handmade by a company &#39;family&#39; and that this type of &#39;bug&#39; human remains in the end. Well after the slight disappointment, not a big deal in the end, you should leave at 40% and it goes well. And the sound? what about in the end? Subjective question but then demand a clear-cut answer. Yes the sound is there, round, heavy, with a unique presence and a depth worthy of a real Moog. Having had the Prodigy, D heard Mininmoog and tried the Little Phatty I had an idea of ​​what to expect. It is far from an emulation or a wave reproduction competitor (Minimax in harware, Minimosta in soft etc. ....). To have used the software versions I can say no, no, not the Voyager is incomparable with those emulations (here I think we should buy an ear if you do not tell the difference). The filters are to fall and give a 3 Osc heaviness, a presence out of proportion to what is being done in the virtual. Sorry but Voyager is open more than a Pc not only in terms of components. Now it&#39;s like all instruments, as have the interface that does not offend the sound and restores correctly in your console. When I see tables Berhinger mix or connected to the Boss will quickly behind a common sound card and this, to process the signal to a Pro or an MS20 One I wonder what&#39;s the point of keeping such machines . In a VST effect will be much better case. Different banks (very numerous and varied) are very representative of the capabilities of Voyager. Go around is a good indication of the potential of the instrument. Bass, leads, tablecloths have a unique presence and calls for the creation and manipulation. Part Modulation / MOD is very interesting and beautiful combinations can include the LFO sync to Midi. Found among other low Kraftwerk, Boards of Canada, the leads of Gary Numan and Daft Punk. Artists at different times, which marks out the timeless of the craft. There is no effect on the machine and sequencers and no one way better. To each his part and it will run itself. Using recently and big slap. I did not expect to be much surprised by the presence of this instrument or by his stature and ergonomics. First-Class: The negative opinion: Those disappointed not to find a &#39;clone&#39; Model C or D and confident that this new version does not compare with the old. Yes it&#39;s true it&#39;s not the same machines, and in a sense better. What interest to purchase or redeem the instrument even after 30 years? Second-Class: The positive opinions: those excited about this release and its modern meaning, memory, stability, noon, possible extensions, the new look of synth and sound just as strong and timeless. Well, I place in the second category without hesitation, with no subsequent models I do not care to claim them. And a reminder, those who constantly compare a tear in his eye the old synths and modern with the old refrain of &#39;good old days&#39; or the machines were so much better. It&#39;s a war, I think losing. The philosophies of work musicians, studios and music in general have changed in the meantime so that the nature of the instrument is turned upside down as well. A Minimoog Model D was sold in 1979 is approximately $ 2000 20,000 francs (the dollar was at about 10f) or € 3000 (excluding import fees that were not given). I even read that he bought by Kraftwerk was around 30 000francs (4500 €). As for minimum wage at the time = 1200francs or 182 € / month (almost always). Well buy a Minimoog in 1979 amounted to leave, at a minimum, 16 months&#39; salary if they stay smicar !!!!!. Today it is as if you sold the same instrument: € 1,365 (basis of current minimum wage) x16 =...... € 21 840! What could be better? A bit expensive the Minimoog D right? So the good old days how it is? Inaccessible? A little yes. And it&#39;s a little exercise easy to do with a lot of &#39;references&#39; at the time (determined without import fees): Prophet 5 = 40 in 78 000f! , Arp Odyssey 000f = 20 in 77, EMS AKS = 72-6000f, Roland System 100 = 16 000f, etc etc. .... In other words, times change and access to instruments as well. In the end I think we can say that the Voyager is in its time, like it or not with what it takes to make it an instrument worked effectively and resolutely stamped MOOG. Finally a synthesizer very good, very musical, very well built and a beautiful invitation to creativity. With Dave Smith Mono Evolver Key (in a more accessible and more experimental), they are gone, in my opinion, the best two analog mono in recent years. I have an Electric Blue cherry wood, v3. A limited edition of 15 copies only. First, the first impression is amazing. The unit is just 2 times larger than what we imagine the pictures. The buttons are huge, and the backlight side, it's arguably the best synth I've ever had in his hands. The only problem is its management of the Voyager of the velocity and aftertouch. Not easy to understand at first, but the latest OS fixes bugs have from the beginning. As against the touch screen is amazing, and despite the fact that travel is monaural, it was released in Stereo and with this screen is a breeze to pan both filters with unique effects. This is interesting. As I also have a Studio Electronics SE1x, I compared the two devices in the field of sound. The SE1 is more aggressive, it also generates more infrabass which confirms its dominance in all mix R & B or Rap, for example. The filter 24db filter that HE called 'Moog' has NOTHING to do with that of the Voyager. Just starting to get self oscillation completely different results! The Voyager 2 filters to absolutely extraordinary and it is far far away from all emulations of virtual instruments. It's inexplicable, some are from the presets sound like no other synth coui.les. It's great! The sound of the Voyager is more diversified, with the ring mod, being gradual transition of a waveform to another. There are two times more accurate in all paramettres (the SE1 offers settings between 0 -> 127 while the Moog's 0 -> 255). Note that the Voyager was released in stereo, because it has two filters that can be easily with the traffickers diabolical touch screen. An excellent value for money despite the fact that it is expensive for a monophonic synth. Do not trust the pictures, the contruction is exemplary, the finish is exemplary and all worth the price. It must have to be to be convinced, and playing is fun. It is an instrument in itself. The Rolls of the synthesis.